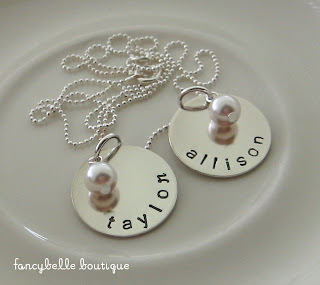 Miss Fancybelle: Hand-Stamped Jewelry Debuts! Just a quick announcement about the recent debut of our new hand-stamped personalized name necklace collection at Fancybelle Boutique! We've already made our first online sale and have several more styles on the way in both sterling silver and copper designs. I say "we" and "our" because this endeavor is partnership between me and my husband, who is a professional metalworker...and quite a meticulous stamper as well. He practiced for hours and hours before making the first test pieces. Coming yet this weekend to the shop are single initial necklaces (perfect for jewelry minimalists), 2-in-1 necklaces and a gorgeous "Dream" copper butterfly necklace. Can't wait to share photos and news with you! I am going to share this with my husband. Mother's day is coming after all and contrary to popular belief I do not want a leaf blower! I actually only wear my wedding rings and that is it. I have a charm bracelet that I haven't worn since Baby #2, but a necklace might be nice!